After spending a long Texas summer around the pool, your natural stone coping has taken a beating! 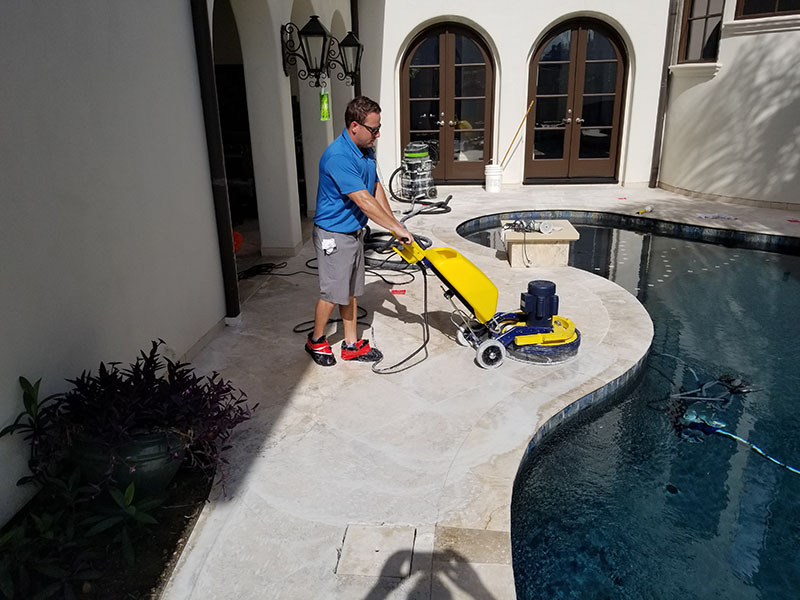 Between the constant sun exposure and the chemicals from the pool water being left on the stone, you will be in need of a serious deep cleaning and sealing for your natural stone. We frequently see travertine and slate surrounding pools, both of which are sensitive to moisture and chemicals. If you have had lots of foot traffic in and out of the pool your stone’s seal will become worn down even quicker. At Modern Stone Care we offer high quality and affordable poolside natural stone cleaning and sealing services. We work with a wide variety of natural stone surfaces to keep them in strong condition and preserve their beauty for as long as possible. Some of these stones include slate, granite, marble, travertine, limestone, and tile. If you have a different type of stone or material surrounding your pool give us a call to explore your options with us. Many natural stone materials are porous and cannot stand up against constant exposure to moisture. Even indoor natural stone flooring requires regular maintenance including deep cleaning, polishing, and sealing services. Whenever you are looking for the highest quality and affordable stone care in the Greater Houston area you are looking for us! Do not let your natural stone go untreated after months of heavy sun and chemical exposure. Schedule an appointment with Modern Stone Care to have your pool’s coping deep cleaned and sealed. We use high quality sealants that you can rely on to protect your natural stone from prolonged exposure to the sun and harsh pool chemicals. Our sealants are clear so that they do not alter the appearance of your stone.